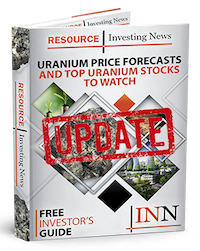 Uranium remains a hot commodity after a significant price increase in 2018, and many experts expect further gains this year. Speaking with the Investing News Network at the recent Vancouver Resource Investment Conference, Niko Cacos, president and CEO of Blue Sky Uranium (TSXV:BSK), said he feels optimistic. Blue Sky is focused on its Amarillo Grande uranium project in Argentina, which Cacos said is “not just a new deposit, but an entire district of uranium.” The company is currently working on a preliminary economic assessment, with news soon to be released. Cacos believes that investors should watch Blue Sky and other small-cap uranium companies in 2019. Listen to the interview above for more insight from Cacos on Blue Sky and Argentina. You can also click here to view our full playlist from the conference on YouTube. Editorial Disclosure: Blue Sky Uranium is a client of the Investing News Network. This article is not paid-for content.